Song: Do You Know Karate? 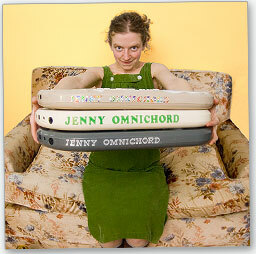 "Jenny Omnichord" is a solo side- project of 22 year-old Jenny Mitchell, vocalist, song-writer and multi-instrumentalist for Guelph, Ontario's noted young indie band The Barmitzvah Brothers. In fact, it was the purchase of an omnichord in Jenny's father's thrift store 8 years ago that set her along this path, its carnivalesque, slightly Hebraic sounds leading two young gentile girls to pick the somewhat ironic "Barmitzvah Brothers" as the name for their band. And while Jenny subsequently branched off into other instruments, among them bass and electric guitars, trumpet, banjo, and keyboards, it is the omnichord that has always remained her first love, a slightly geeky invention played by almost no one, capable of a myriad of sounds and effects, and for some reason scorned or unknown or ignored for almost all of its life. Well, now, it is time for the omnichord to take its rightful position among the upper echelons of musical instruments, and Jenny shall be the liberator who shall set it free, the vessel through whom this most intricate of the keys shall finally achieve the appreciation and respect that it so richly deserves. Or not. Come what may, Jenny will still continue to love and play it, will try to learn even more of its many and hidden secrets, and will keep trying to bring its joyful wonders to the world, whether we are ready or not. So be prepared to smile, to be amazed and to be bewildered. The omnichord is coming, and we will all be the better for it.